We can view this as the space of matrices modulo a action, which has homogeneous “Plücker” coordinates given by the minors. Of course, these are not coordinates in the true sense, for they are overcomplete. In particular there exist quadratic Plücker relations between the minors. In principle then, you only need a subset of the homogeneous coordinates to cover the whole Grassmannian. To get to the positive Grassmannian is easy, you simply enforce that every minor is positive. Of course, you only need to check this for some subset of the Plücker coordinates, but it’s tricky to determine which ones. In the first talk of the day Lauren Williams showed how you can elegantly extract this information from paths on a graph! In fact, this graph encodes much more information than that. In particular, it turns out that the positive Grassmannian naturally decomposes into cells (i.e. things homeomorphic to a closed ball). The graph can be used to exactly determine this cell decomposition. And that’s not all! The same structure crops up in the study of quantum groups. Very loosely, these are algebraic structures that result from introducing non-commutativity in a controlled way. More formally, if you want to quantise a given integrable system, you’ll typically want to promote the coordinate ring of a Poisson-Lie group to a non-commutative algebra. This is exactly the sort of problem that Drinfeld et al. started studying 30 years ago, and the field is very much active today. The link with the positive Grassmannian comes from defining a quantity called the quantum Grassmannian. The first step is to invoke a quantum plane, that is a -dimensional algebra generated by with the relation that for some parameter different from . The matrices that linearly transform this plane are then constrained in their entries for consistency. There’s a natural way to build these up into higher dimensional quantum matrices. The quantum Grassmannian is constructed exactly as above, but with these new-fangled quantum matrices! The theorem goes that the torus action invariant irreducible varieties in the quantum Grassmannian exactly correspond to the cells of the positive Grassmannian. The proof is fairly involved, but the ideas are rather elegant. I think you’ll agree that the final result is mysterious and intriguing! And we’re not done there. As I’ve mentioned before, positive Grassmannia and their generalizations turn out to compute scattering amplitudes. Alright, at present this only works for planar super-Yang-Mills. Stop press! Maybe it works for non-planar theories as well. In any case, it’s further evidence that Grassmannia are the future. From a historical point of view, it’s not surprising that Grassmannia are cropping up right now. In fact, you can chronicle revolutions in theoretical physics according to changes in the variables we use. The calculus revolution of Newton and Leibniz is arguably about understanding properly the limiting behaviour of real numbers. With quantum mechanics came the entry of complex numbers into the game. By the 1970s it had become clear that projectivity was important, and twistor theory was born. And the natural step beyond projective space is the Grassmannian. Viva la revolución! Yes and I’ll have another one of those please waiter. One shot Geometry, topped up with Algebra and then a squeeze of Topology. Shaken, not stirred. Okay, I admit that was both clichéd and contrived. But nonetheless it does accurately sum up the content of this post. We’ll shortly see that studying affine varieties on their own is like having a straight shot of gin – a little unpleasant, somewhat wasteful, and not an experience you’d be keen to repeat. There’s a more general notion than an affine plane curve that works in . We say a hypersurface is the zero of a single polynomial in . The cone in that we say last time is a good example of a hypersurface. Finally we say a hyperplane is the zero of a single polynomial of degree in . Hopefully all that blathering has convinced you that there really are a lot of varieties, and so it looks like it’s going to be hard to say anything general about them. Indeed we could look at each one individually, study it hard and come up with some conclusions. But to do this for every single variety would be madness! We could also try to group them into different types, then analyse them geometrically. This way is a bit more efficient, and indeed was the method of the Ancients when they learnt about conic sections. But it is predictably difficult to generalise this to higher dimensions. Moreover, most geometrical groupings are just the tip of the iceberg! What with all this negativity, I imagine that a shot of gin sounds quite appealing now. But bear with me one second, and I’ll turn it into a Long Island Iced Tea! By broadening our horizons a bit with algebraic and topological ideas, we’ll see that all is not lost. In fact there are deep connections that make our (mathematical) life much easier and richer, thank goodness. First though, I must come good on my promise to tell you about some subset’s of that aren’t algebraic varieties. A simple observation allows us to come up with a huge class of such subsets. Recall that polynomials are continuous functions from to , and therefore their zero sets must be closed in the Euclidean topology. Hence in particular, no open ball in can be thought of as a variety. (If you didn’t understand this, it’s probably time to brush up on your topology). There are two further ‘obvious’ classes. Firstly graphs of transcendental functions are not algebraic varieties. For example the zero set of the function is not an affine variety. Secondly the closed square is an example of a closed set which is not an affine variety. This is because it clearly contains interior points, while no affine variety in can contain such points. I’m not entirely sure at present why this is, so I’ve asked on math.stackexchange for a clarification! How does algebra come into the mix then? To see that, we’ll need to recall a definition about a particular type of ring. Definition 2.1 A Noetherian ring is a ring which satisfies the ascending chain condition on ideals. In other words given any chain s.t. for all . It’s easy to see that all fields are trivially Noetherian, for the only ideals in are $latex 0$ and itself. Moreover we have the following theorem due to Hilbert, which I won’t prove. You can find the (quite nifty) proof here. Theorem 2.2 (Hilbert Basis) Let be Noetherian. Then is Noetherian also, and by induction so is for any positive integer . This means that our polynomial rings will always be Noetherian. In particular, we can write any ideal as for some finite , using the ascending chain condition. Why is this useful? For that we’ll need a lemma. Lemma 2.3 Let be an affine variety, so some . Let , the ideal generated by . Then . Proof By definition so . We now need to show the reverse inclusion. For any there exist polynomials in and in s.t. . Hence if then so . Let’s put all these ideas together. After a bit of thought, we see that every affine variety can be written as the zero set of a finite number of polynomials . If you don’t get this straight away look back carefully at the theorem and the lemma. Can you see how to marry their conclusions to get this fact? This is an important and already somewhat surprising result. If you give me any subset of obtained from the solutions (possibly infinite) number of polynomial equations, I can always find a finite number of equations whose solutions give your geometrical shape! (At least in theory I can – doing so in practice is not always easy). You can already see that a tiny bit of algebra has sweetened the cocktail! We’ve been able to deduce a fact about every affine variety with relative ease. Let’s pursue this link with algebra and see where it takes us. Definition 2.4 For any subset we say the ideal of is the set . In other words the ideal of is all the polynomials which vanish on the set . A trivial example is of course . Try to think of some other obvious examples before we move on. Let’s recap. We’ve now defined two maps and . Intuitively these maps are somehow ‘opposite’ to each other. We’d like to be able to formalise that mathematically. More specifically we want to find certain classes of affine varieties and ideals where and are mutually inverse bijections. Why did I say certain classes? Well, clearly it’s not the case that and are bijections on their domains of definition. Indeed , but so isn’t injective. Furthermore working in we see that so is not injective. Finally for so is not surjective. It’ll turn out in the next post that a special type of ideal called a radical ideal will play an important role. To help motivate its definition, think of some more examples where fails to be injective. Can you spot a pattern? We’ll return to this next time. Now that we’ve got our maps and it’s instructive to examine their properties. This will give us a feeling for the basic manipulations of algebraic geometry. No need to read it very thoroughly, just skim it to pick up some of the ideas. Proof We prove each in turn. (2) We first prove “ “. Let . Wlog assume . Then . So certainly , which is what we needed to prove. Now we show “ “. Let . Then and . So there exists s.t. . Hence . But s0 . (3) “ ” is trivial. For “ ” note that , and then it’s trivial. (6) If then by definition, so . (7) The relation follows from definitions exactly as (6) did. For the “if” statement, suppose , some ideal . Then by (5) so by (4) . Conversely, suppose . Then is the zero set of so an affine variety by definition. That was rather a lot of tedious set up! If you’re starting to get weary with this formalism, I can’t blame you. You may be losing sight of the purpose of all of this. What are these maps and and why do we care how they behave? A fair question indeed. The answer is simple. Our bijections will give us a dictionary between algebra and geometry. With minimal effort we can translate problems into an easier language. In particular, we’ll be allowed to use a generous dose of algebra to sweeten the geometric cocktail! You’ll have to wait until next time to see that in all its glory. Finally, how does topology fit into all of this? Well, Lemma 2.5 (1)-(3) should give you an inkling. Indeed it instantly shows that the following definition makes sense. Definition 2.6 We define the Zariski topology on by taking as closed sets all the affine varieties. In some sense this is the natural topology on when we are concerned with solving equations. Letting we can make some comparisons with the usual Euclidean topology. First note that since every affine variety is closed in the Euclidean topology, every Zariski closed set is Euclidean closed. However we saw in the last post that not all Euclidean closed sets are affine varieties. In fact there are many more Euclidean closed sets than Zariski ones. We say that the Euclidean topology is finer than the Zariski topology. Indeed the Euclidean topology has open balls of arbitrarily small radius. The general Zariski open set is somehow very large, since it’s the complement of a line or surface in . Next time we’ll prove that for algebraically closed every Zariski open set is dense in the Zariski topology, and hence (if ) in the Euclidean topology. In particular, no nonempty Zariski open set is bounded in the Euclidean topology. Hence we immediately see that the intersection of two nonempty Zariski open sets of ^n is never empty. This important observation tells us the the Zariski topology is not Hausdorff. We really are working with a very strange topological space! And how is this useful? You know what I am going to say. It gives us yet another perspective on the world of affine varieties! Rather than just viewing them as geometrical objects in abstract we can imagine them as a fundamental world structure. We’ll now be able to use the tools of topology to help us learn things about geometry. And there’s the slice of lemon to garnish the perfect cocktail. I leave you with this enlightening question I recently stumbled upon. Both the question, and the proposed solutions struck me as extremely elegant. Time to introduce some real mathematics! Today we’ll be talking about algebraic varieties. Gosh, that already sounds pretty heavy going. Part of the problem with starting algebraic geometry is the none of the nomenclature makes any intuitive sense. So it’s probably worth going on a bit of a historical digression to find out where this term originated. Back in the 19th century, a good deal of algebraic geometry was done by French mathematicians. So it’s not surprising that much of the terminology of basic algebraic geometry has been borrowed from French. The word variety is one example. In 19th century French, a variété was an umbrella term for a geometrical object in space. A typical example of a 19th century variété would be a manifold, that is a space that looks locally like everywhere. As time passed, the word variété caught on in English, despite the fact it seemed linguistically arcane. Mathematicians rarely worry about such things, it seems. As maths became increasingly formalised and rigorous, new terms like manifold and surface were introduced to describe particular types of varieties. By a combination of French stubbornness and historical accident, the word variety eventually came to refer to an abstract class of geometrical ‘things’. (If you want more information, read this wonderful account of the history of Algebraic Geometry). Hopefully the concept of algebraic presents fewer difficulties. As I mentioned in an earlier post, algebra is essentially the study of solutions to (mostly polynomial) equations. So what’s an algebraic variety? You got it – it’s a geometrical object which can be represented as a solution of (one or many) polynomial equations. I’d properly better formalise all that as a definition. But first we need to know what kind of space we are working in. In other words, where do we allow our algebraic varieties to exist? The naive answer is in -dimensional Euclidean space. This is indeed a good suggestion, and yields many informative examples, but there is too much loss of generality. Instead we’ll work in -dimensional affine space which I’ll define shortly. Keep the idea of -dimensional Euclidean space in mind as an intuition, though! Definition 1.1 Let be a field. We say affine space of dimension over is the set . You might think this is a bit of an odd notation. After all it takes more time to write than and they are the same as sets by definition. However there is a subtlety. Mathematicians often think of as being endowed with a natural vector space structure, with an origin and addition operation. Affine space is to be regarded merely as a geometrical blank canvas, with no associated operations or distinguished points. In fact we’ll see later that the right way to think about is as a topological space. Since this post has an historical bent, I’ll digress a little to explain why we use the word affine. The word has its roots in Latin – affinis, meaning ‘related’. Mathematical usage seems to have been introduced by Euler to describe a type of geometry that studies how geometric objects are ‘related’ by slanting and scaling. Absolute notions of length and angle cease to make sense in this setting. Rather affine geometry is concerned more with the concepts of parallelism and ratios of lengths. This might all seem a bit abstract, so let me put it another way. Affine geometry is the study of shapes which remain unchanged when they are transformed in such a way as to preserve straight lines. These so called affine transformations crop up all the time – translation, expansion, rotation are all examples we meet in everyday life. Affine geometry tries to make sense of all these in one geometrical space, affine space. Definition 1.2 Let be a subset of the polynomial ring. We define the zero locus of to be the set . Sorry if that definition was a bit out of the blue. You may have to get used to me moving fast as this blog evolves. Remember that the polynomial ring is just the set of all polynomials in the variables endowed with the obvious addition operation allowing you to add two polynomials. In plain English this definition is saying, ‘the zero locus of a set of polynomials, is all the points that make all the polynomials zero’. Sensible, huh? Let’s do some examples. If we fix and work in we have is a circle. Can you see what is? (Hint: the answer is in an earlier post)! Now if we work in we can get some familiar surfaces. is a cone. is a weird shape called a twisted cubic, pictured below. Have some fun trying to think up some more wacky and wonderful shapes that can be represented as the zero locus of a subset of . (Note: we’ll sometimes use the terminology as I have done here). Do leave me a comment if you come up with something fun! Finally we’re ready to say what an algebraic variety is. Here we go. Definition 1.3 A subset is called an affine algebraic variety if there exists some subset of the polynomial ring such that . Read that a couple of times and make sure you understand it. This really is the bedrock on which the subject stands. 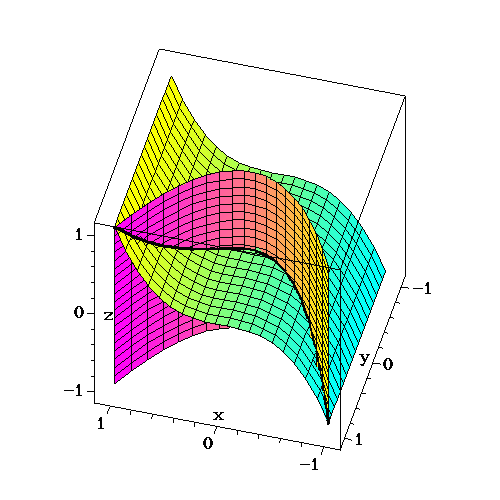 In plain English this merely says that ‘an affine algebraic variety is a geometrical shape which can be represented as the zero locus of some polynomials’. That’s exactly what we said it should mean above. (Note: I’ll often call affine algebraic varieties just affine varieties for short). Right, that’s quite enough for one night. Next time I’ll talk about what Hilbert had to say about affine varieties. We’ll also start to see a surprisingly deep connection between algebra and geometry. Oh and if someone reminds me I’ll throw in an amusing video, like this marvellous CassetteBoy offering. One more thing to do before you go – think about what kinds of shapes aren’t affine varieties. Answers in the comments please! Looking for such examples is something mathematicians like to do. It’ll hopefully give you a better understanding of what the concepts really mean! I’ll touch on this properly next time. Apologies that this post is a little late – I have been struggling with some technical issues! I hope now they are sorted, thanks to the kindness of the IT Department at New College, Oxford. and a nice cup of tea. I always find that helps. Before we get down to business, you might want to put this delightful recording on. It’s always nice to have a bit of background music, and Strauss just seems to fit with Algebra somehow. Perhaps you had to think for a moment before realising that this just defines a parabola in 2D space, pictured below. These example illustrate that the solutions to equations can come in the form of points, or curves, and it’s not hard to see that solutions to equations in sufficiently many variables can define surfaces of any dimension you like. 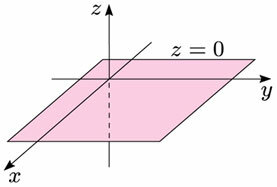 For example the equation defines a plane in 3D space. So we can easily see that Algebra gives rise to geometrical structures of the type we discussed in the last post. It should now seem natural to study geometrical structures from an algebraic point of view. Voila – we have the motivation for Algebraic Geometry. There’s nothing to restrict us to studying the solutions (often referred to as zeroes) of a single equation. In fact many interesting and useful geometric constructions arise as the simultaneous zeroes of several equations. Can you see two equations in (some or all of) the variables whose simultaneous solutions give rise to the -axis in 3D ? The technical terminology for the collection of simultaneous zeroes of several equations is an algebraic set. It is the most fundamental object of study which we will focus on. Here we reach a slight technical impasse. For what follows I’ll assume a familiarity with elementary abstract algebra as outlined on the Background page. This may be viewed as a technical toolkit for our forthcoming studies. I’ll also assume some very basic knowledge about Topology, though not much more than can be gleaned by a thorough reading of the Wikipedia page. If you’ve never come across abstract algebra before, now is the time to do some serious thinking! I can’t promise it’ll be easy, and it might take a couple of days to get your head around the concepts, but I promise you it’s worth it. I’ll be happy to answer any questions commented on the Background page, and will flesh out the currently sparse details in the near future. We only every consider polynomial equations, which are those of the form where is a finite sum of nonnegative integer powers of products of the variables . Thus , the circle, is admissible for study but is not. It turns out that not much is lost by restricting our study to polynomials only. In some sense any mathematically interesting curve can be approximated arbitrarily closely by the set of solutions to polynomial equations. (This entirely depends on your definition of mathematically interesting though)! The equations are of course and . Geometrically this is true since the -axis is the intersection of the two planes defined by and . Algebraic Geometry – Sorry, What? Okay it’s a bit of a mouthful. Let’s break it down a bit. You probably remember geometry from school. Drawing triangles and calculating angles. Maybe even a few circle theorems. Pretty arcane stuff, you probably agree. Turns out that this is just one tiny area of what mathematicians call Geometry. Roughly speaking Geometry is the study of any kinds of curves, shapes and surfaces you can imagine. We naturally think of curves as “1-dimensional objects” you can draw on a “2-dimensional” piece of paper. Similarly we think of surfaces as “2 dimensional objects” that exist in “3-dimensional space”. A piece of paper is an example of a surface, as it the surface of a beach ball. We can also think of “3-dimensional objects” like a solid snooker ball. In general geometry answers questions about what properties these things have. Now you may be thinking that this is all a bit pointless. After all we know quite a lot about how a beach ball behaves. There are two caveats however. Firstly the surface of a beach ball is a very symmetrical object. We want to be able to make conclusions about vastly asymmetrical surfaces, and possibly ones it’s hard to imagine. These kind of general observations are useful because then if someone asks us about a specific case, a beach ball with a ring donut stuck onto it for example, we can tell them it’s geometrical features with no extra work. The second pertinent observation is that sometimes we want to know about geometry in more than “3-dimensions”. Hang about, that’s completely pointless, I hear you say. Fair point, but you are forgetting we live in a 4-dimensional universe – 3 space and 1 time dimension. And thanks to Einstein’s General Theory of Relativity we know that gravity bends space. So knowing about how geometry works in 4D is vital for sending men to the moon, or getting accurate GPS signals from satellites. Now you might be starting to see that Geometry is quite broad, quite useful but also quite hard. After all there doesn’t seem to be much a triangle has in common with the surface of the Earth! Nevertheless we’ll see in the next post that using Algebra we can start to pin down some classes of curves and surfaces that do share some surprisingly strong properties. 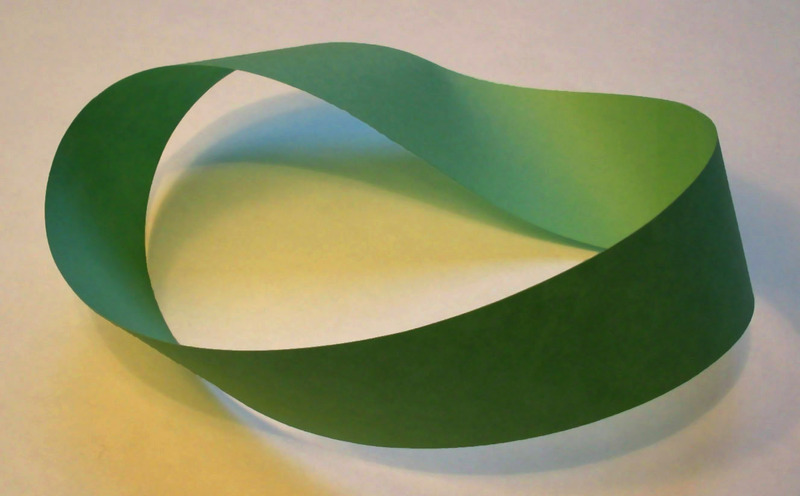 As a challenge before the next post, make a Mobius Strip, pictured above, and count how many sides it has. Okay that’s easy, if a little odd if it’s the first time you’ve seen it. You can see that even an easily constructible surface can have some surprises. Try and imagine some other odd surfaces; if you think of anything good then comment it! One such is the Klein Bottle. Don’t worry about the technical terminology on the Wikipedia page, just have a look at the pictures. It’s a 2-dimensional surface that can only be “drawn” in 4-dimensions. Looks like we’ll have our work cut out!